When the doors of the Alhambra Theatre, Bradford opened at 10am there was a large queue of excited young boys all waiting for their chance to audition to be part of Yorkshire’s biggest and funniest professional pantomime. Qdos Entertainment had to choose only four boys and the standard of those auditioning was very high. However after a very busy morning a decision was made and we are delighted to announce that Will Collier from Rothwell and Theo Francis from Embsay will be taking on the role of ‘John’ and William Campbell from Cullingworth and Leo McDonnell from Horsforth will be taking on the role of ‘Michael.’ There is also a reserve team of boys who were chosen on the day: Morgan Bass from Bingley; John Hudson from Guiseley; Dylan Miles-Davis from Idle; and Frazer Lee from Leeds. 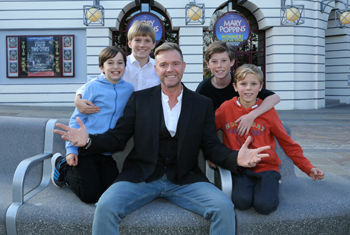 Darren Day, who will be playing Captain Hook in Peter Pan, joined the auditions to offer good luck to those taking part. He offered a warm welcome to the boys who will join the cast alongside Yorkshire’s best-loved comedian and panto performer Billy Pearce, soap-star Charlie Hardwick and pop and musical theatre sensation Jon Lee. With amazing 3D effects, a barrel-full of comedy and a very hungry crocodile, Peter Pan is the ideal festive treat for everyone!